Trader Joe’s is no stranger to slaw based salads, so their new all-slaw salad might be unprecedented but isn’t a surprise. Like their broccoli slaw, and Chinese chicken salads before it, Trader Joe’s Rainbow Slaw Salad is a big pile of shredded veggies. What’s different about this version is the riot of colors and flavors at play. Slaw has always been the laziest form of salad. Unlike some of Trader Joe’s rather well thought through salads – like the very pretty Grain Country salad – a slaw salad doesn’t have to worry about presentation or what to layer where or even freshness of produce, a slaw salad just runs everything through an industrial dicer and dumps the resulting shreds into a single, undifferentiated pile. 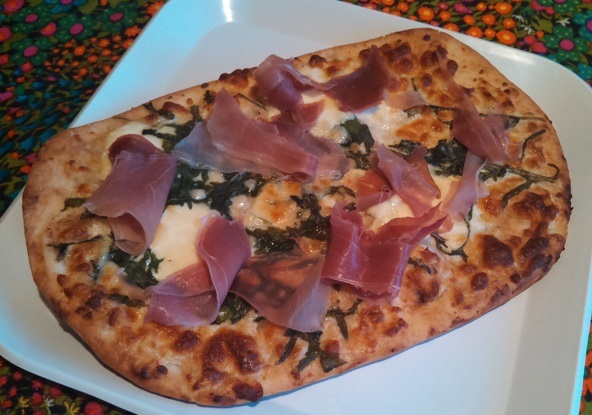 Like “dump pies“, the result might well be tasty, but they don’t really impress anyone. However, Trader Joe’s Rainbow Slaw Salad bucks this slaw trend. By combining a variety of colorful and tasty produce Trader Joe’s has produced a slaw salad that’s actually worth talking about. Take one look at the Rainbow Slaw Salad and you’ll immediately notice two things – one, that this is a lot of slaw we’re looking at, and two, that it really is very colorful. 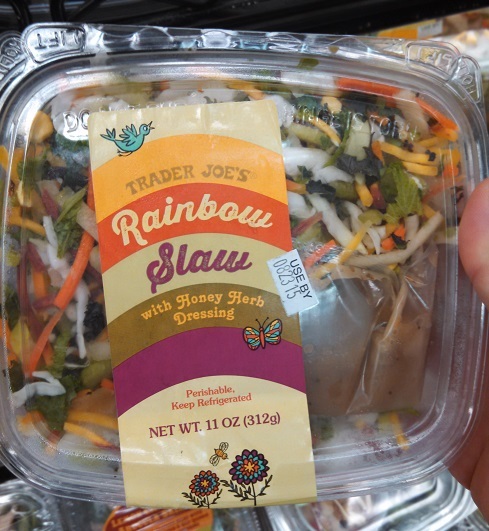 At the very least, we can say that Trader Joe’s has fully delivered on the “rainbow” and “slaw” parts of the salad. In this case, the myriad of bright colors comes from the many colorful veggies that go into this really massively vegatatious salad. Said vegetables include cabbage, sweet onions, kale, celery, mustard greens, corn kernels, and every color of carrot from the aptly named Carrots of Many Colors. All julienned up together, the result is a truly rainbow-hued mix that ranges from pale yellow, through greens, yellow and reds to vivid purple. Very nice to look at – but what about the taste? Is that also nice? Well, yes – I suppose. The Rainbow Slaw Salad tastes good in so far as it tastes very healthsome and nutritious – you can really taste the vitamins and nutrients in each vegetable packed bite. To balance out the all vegetables/all the time approach, TJ’s has also seeded the salad with finely chopped bits of tart green apple, which pop up here and there to inject a bit of sweetness. The honey herb dressing – a sort of sweet, seasoned vinaigrette, helps to add a lot of life to the salad – perking up the greens with a light zestiness that does a good job heightening the natural flavors of the mix rather than masking them. As I chewed away at mouthful after mouthful, I couldn’t help but feel like I was appreciating the subtle sweetness and inherent flavor of these so often sidelined vegetables in a whole new light. If there’s one thing this salad does well, it’s letting wholesome veggies speak for themselves. On the other hand, it’s certainly not the most delicious Trader Joe’s salad I’ve ever had. In fact, if I’m being honest, it doesn’t even rank in the top 50%. Placed back to back with the Bacon and Spinach salad, or even the Arugula and Pimento Salad, Rainbow Slaw just feels incomplete. While I liked what it was doing, if I was hungry for slaw and vinagraette, I’d be far more likely to pick up Trader Joe’s Honey-Glazed Miso Salmon Salad which does a lot of the same things, just a little better. Would I Recommend It: Yes, it certainly makes for a good side. Would I Buy It Again: Sure, if I wanted to add some veggies to a meaty entree. Final Synopsis: A healthy and light veggie salad. Hot like the sun is hot. 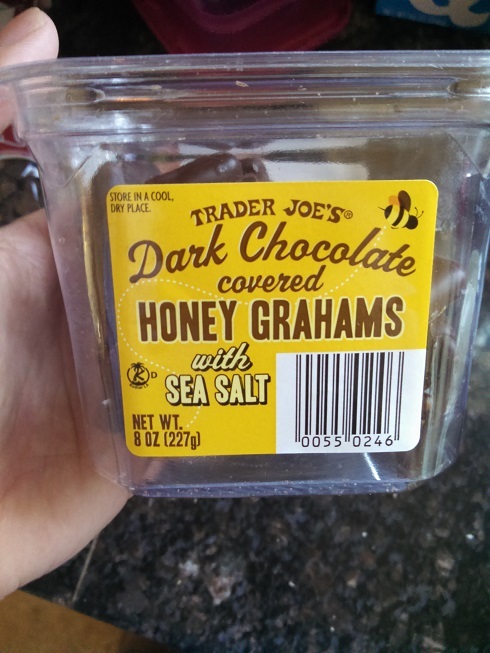 I’ve seen some pretty shocking things appear on the Trader JOe’s shelves over the years – chocolate/wine drinks, pumpkin greek yogurt, chocolate bars made with bacon – but I’m usually able to take it all in stride. When you shop at Trader Joe’s you have to expect the unexpected. However, Trader Joe’s Srirach Ranch Dressing I was totally unprepared for. Ranch dressing? Available at Trader Joe’s? Holy crap! Unfortunately, however, this new salad dressing offering is a mixed blessing. What it is: Very spicy ranch dressing. Worth it: Good for wings, but too spicy for salad. As you might have gleaned from the frequency I write about them, I’m a fan of salads. I’m a fan of salads in the same way that rats are a fan of untended grain silos – which is to say I eat salads with a ravenous, unstoppable intensity. With their plethora of fresh produce, Trader Joe’s is a real boon for salad lovers like me – except that they seemed to miss the memo on two important points. One, for some reason Trader Joe’s refuses to sell reasonable quantities of croutons at reasonable prices. You can buy a small sachet of artisinal cheese bagel rounds for $4.99, and that’s it. How can you carry two types of salmon jerky, but no croutons, Trader Joe? Madness. Two, Trader Joe’s refuses to expand their salad dressing line. The salad dressings they offer are good, sure. I love a little bit of Asian Sesame Seed Dressing or Balsamic Vinaigrette on my freshly washed greens, but the quantities are laughable. Only available in small, solid glass, 8 oz bottles, picking up salad dressing at Trade Joe’s feels more like picking through potions at a medieval apothecary than shopping for condiments. So as exciting as a new flavor of Trader Joe’s dressing is – and being able to buy ranch dressing at Trader Joe’s is *very* exciting – what I was most shocked by was the new, full-sized, 16 oz. salad dressing bottle. The bulbous plastic bottle with screw on cap might seem weirdly plebeian by Trader Joe’s standards, but it’s nice to see Trader Joe’s do something like a normal person every once in a while as well. So at $2.99 per bottle the price is right, the size is right, and since this is just spicy ranch dressing we’re talking about, surely the flavor is just fine as well. Right? Right? Well, no – not really. Look, I’ve had spicy ranch dressing before. I know what to expect from spicy ranch dressing – that familiar buttermilk creaminess spiced up with some piquant red pepper. Trader Joe’s Sriracha Ranch Dressing may look like it’s taking this route, but they actually deliver something far more intense. Taking the “Sriracha” part of the name seriously, they’ve loaded up this simple dressing with a mouth blistering blast of pure chili paste. 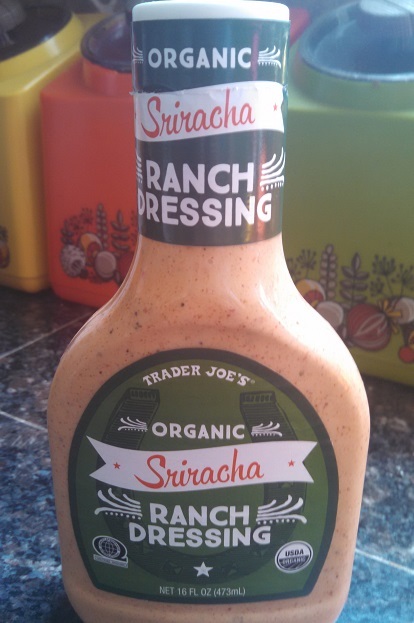 I’m not kidding – this “ranch dressing” might even be spicier than Trader Joe’s own Sriracha knock-off. How does that even work? Overall, the whole ranch dressing part takes a serious back seat to the sriracha. That means if you want to use this dressing to kick up your burger and fries, add flare to your tacos, or serve as a dipping sauce for chicken wings you’re in good shape. However, if you want to slather it on a bed of lettuce and carrots, you had better be ready for your lips to blaze with the fire of a thousand raging suns. It’s far more a hot sauce than a salad dressing. As far as I’m concerned, I could maybe see incorporating this into an Asian noodle salad or similar, but this was way to spicy for my daily salad needs. Would I Recommend It: Only if you like your salads hot. Would I Buy It Again: Nope, too spicy for me. Final Synopsis: A good hot sauce substitute, but not great on salads. Question: What’s green and crazy? Trader Joe’s Popcorn in a Pickle is pickle brine flavored popcorn. Let’s just get that out of the way up top. What it is: Popcorn that tastes like dill pickles. Worth it: Yes – a wildly new taste. Now, weve seen some pretty outlandish popcorn moves from Trader Joe’s – their unpronoucable Beurre Meuniere Popcorn comes to mind, not to mention their partially popped popcorn kernels, and of course the bacon-esque white cheddar variety. I thought, perhaps, that Trader Joe’s mad sciene-style popcorn high jinks had run their course. How sorely I was mistaken. 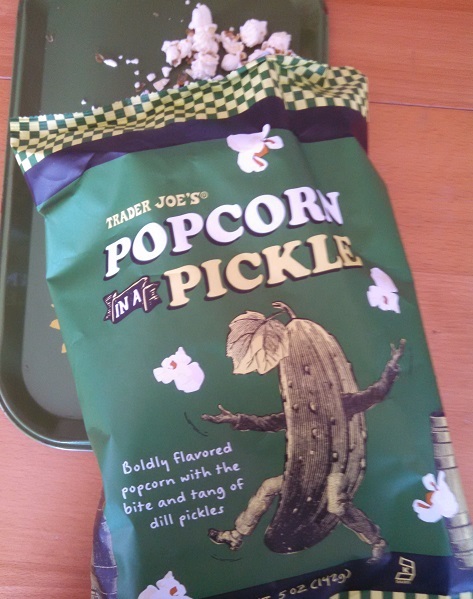 Trader Joe’s new Popcorn in a Pickle is their wildest creation yet – a melding of ordinary salted popcorn and dill pickles. When I was a kid I would sometimes put ketchup and mustard on my popcorn, and that got me branded as something of a local nut job. I daren’t think what would’ve happened if I’d started pouring liberal doses of pickle brine on it too. Instituionalized, probably. Clearly Trader Joe’s doesn’t give a flying hoot what anyone things, because this is a boldly original taste that delivers exactly what they promise – this popcorn really does taste like dill pickles and, what’s more, it’s actually pretty good. Full disclosure, I’m somewhat fond of pickle brine. I have, on more than one occasion, taken a sip from the pickle jar – just to get a touch of that unique, salt and vinegar flavor blast you don’t experience anywhere else in life. This popcorn seems to be trading entirely on people who have felt the urge to that illicit thrill – the brine sippers who say, “Bitter? Salty? Herbal? Sour? Just what I’m looking for!” If you’re looking to replicate the the flavor, if not the feel, of a classic kosher dill (and it is, by the way, kosher) this popcorn has it all. If that’s not you, you can safely give this popcorn a pass. 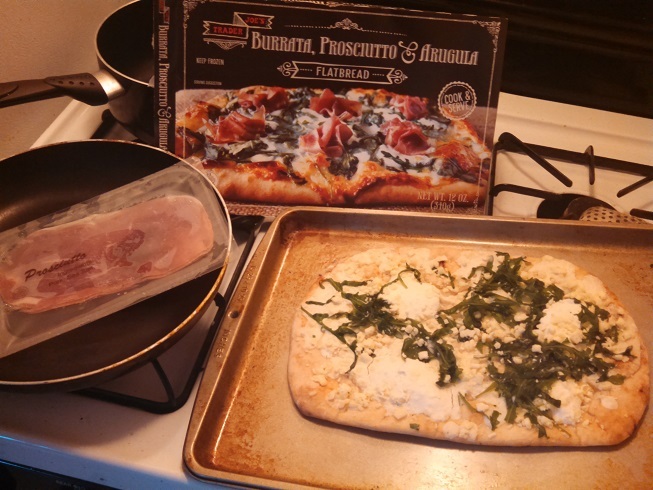 Trader Joe’s is clearly counting on a very narrow slice of the market for this one. Of course, that’s exactly the sort of thing major chip manufacturers, like Lays, Pringles and Doritos, have been doing over the last couple years as they bring out increasingly outlandish flavors. I still see those Lay’s “Wasabi and Ginger” potato chips on store shelves. Sometimes even the most outlandish novelties can make that surprising change into a new classic. Unlike many of those weird flavors, however, Trader Joe’s really nails the authenticity of what they’re going after. This isn’t a “dill pickle-ish” taste, in the way that, say, sour cream and onion potato chips are “sour cream and onion-ish”. These kernels taste like they were each soaked in a jar of pickle juice and left to dry out again. Like Trader Joe’s Bacon-esque popcorn, this is a popcorn to be savored slowly – not munched down by the idle handful. Each popped piece is saturated with so much pickle flavor that you’ll want to chew on one at a time. If you love pickles, or live life with a fearless joie de vivre, try picking up a bag of this stuff while it lasts on the shelves. It’s easy to imagine it’ll have a limited run, and you’re not likely to find something like this ever again. On the other hand, if you’ve never felt an urge to sample a drip of brine then feel free to steer clear. This bold taste is for adventurous eaters only. Would I Recommend It: Yes to the bold, no to the meek. Would I Buy It Again: I actually might! Final Synopsis: The best pickle brine flavored popcorn on the market. Trader Joe’s Turkish Fig Bites fall squarely into that final category. As should be clear from the packaging alone, these are Trader Joe’s own take on that classic, love-’em-or-hate-’em after-school snack, the Nabisco Fig Newton. Usually, when Trader Joe’s goes through the trouble of re-creating an another brands product in their own image they actually end up improving on it. TJ’s seems to have a genuine devotion to only putting their name on quality products that they stand behind, which is truly laudable in this day and age. For example, when they recently released their take on the Sour Patch Kid candy with sweet-and-sour T’s and J’s gummies, I found myself strongly preferring Trader Joe’s delicious, nuanced flavors and all-natural ingredients to actual Sour Patch Kids. 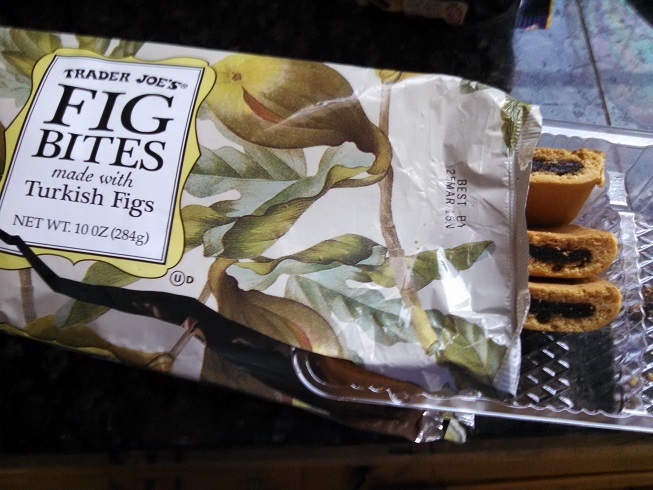 It’s unusual, then, that Trader Joe’s Turkish Fig Bites fall short of the original Fig Newton. You’d think that improving on these would be a piece of cake (or fruit and cake, as the case may be), but instead TJ’s delivers an inferior version – heavier on the dry cake, with less fruit. 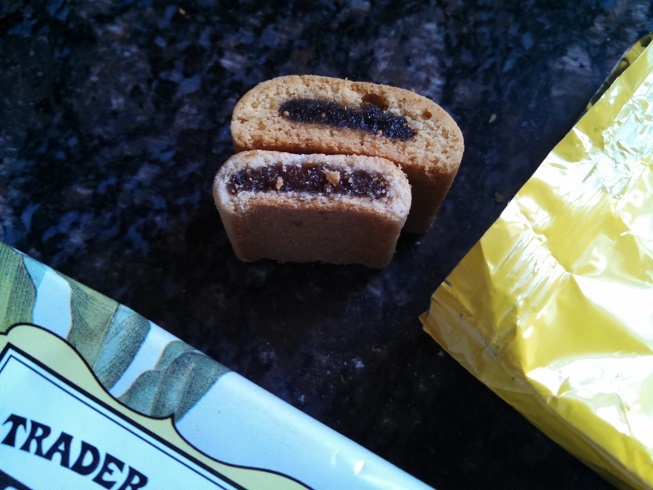 This is a particularly surprising outcome given the super pretty packaging, which manages to bite on the Fig Newton’s signature “yellow” look, while also keeping Trader Joe’s signature quaint whimsy. How could such attention to detail on the packaging be betrayed by underwhelming contents? Well, I guess that’s just life, isn’t it? Figs are something Trader Joe’s does well, and in fact we’ve looked at them several times before, along with their incredible mythic history. And, in fact, the fig part isn’t all that bad. Trader Joe’s promises Turkish figs, which I’m sure these are, but you’d be hard pressed to tell, given the serious mushing and processing they necessarily undergo to be worked into a sweetened cookie. No, it’s the “Newton” part that Trader Joe’s has trouble with. Nabisco must have found just the right recipe to deliver their original drupe-based treat to the world, because no one else ever seems to get it quite right. The generic fig roll snack you come across in drug store always tend to be too dry. Trader Joe’s doesn’t have that problem, but instead screw up the fig to cake ratio – giving you way too much thick and bready cake to the relatively meager amount of filling. 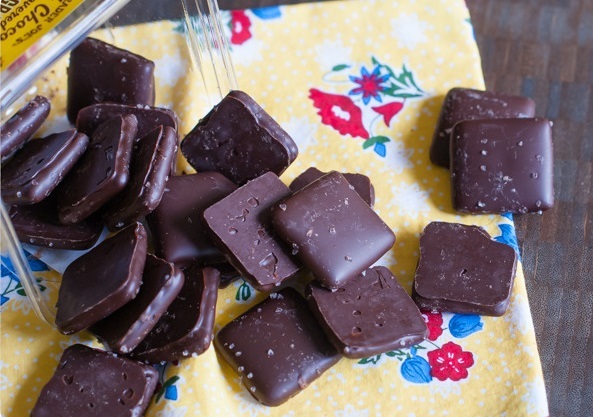 It’s simply not all that satisfying to bite into, giving you a dry mouth without enough sweet fruit to balance it out. To compare I bought a box of Nabisco brand Newtons and compared them side by side. As you can see the Nabisco Netwons are much more refined looking – an elegant balance of just enough dough to the filling. As a result the Nabisco Newtons are much more snackable, while the Trader Joe’s “Newtons” tire you out after two or three. Of course, if it’s the price you’re considering Trader Joe’s more than compensates for its short comings. Each package of Trader Joe’s Fig Bites is a mere $1.99, in comparison to the $5 and up you’ll be asked to pay for Fig Newtons. I may not like TJ’s version quite as much as Nabisco’s, but that price point make a compelling argument for choosing them anyway. By the way, before I get out of here – just what is a “Newton”? It turns out that Fig Newtons don’t owe their name to the revered Grandfather of Gravity (a connection that I always presumed and found troubling, given the absence of apple), but to the humble town of Newton, Mass. where they were first made by the Kennedy Steam Bakery all the way back in 1891. And now you know! Would I Recommend Them: Not really, the original Fig Newton is better. Would I Buy Them Again: The price is low enough, and I’m enough of a cheapskate, that I probably would. Final Synopsis: Fig Newton knockoffs for a reasonable price. Such weird packaging. Look at the little metal studs in the upper corners. Definitely not an original Trader Joe’s product, right? If there’s one thing Trader Joe’s likes to do, it’s suddenly releasing jars of preserved Mediterranean produce with little or no instruction. 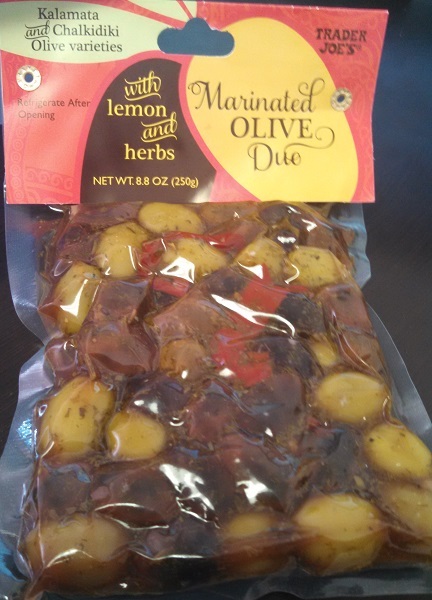 The latest entrant is Trader Trader Joe’s Marinated Olive Duo with Lemon and Herbs, a vacuum packed bag of green and black olives muddled up with a strong shot of lemon zest and thyme – a combination that brings new levels of intense flavor to an otherwise familiar appetizer. What it is: Strong, marinated olives with lemon zest and herbs. Worth it: Yes, if you’re making an anitpasto plate. Otherwise, no. Previously, we looked at Trader Joe’s Preserved Lemon Slices, and before that their various iterations of olives stuffed with almonds and peppers stuffed with olives. Aside from growing on the sunny shores of the wine-dark Aegean, these products are all united by the confusing lack of all instruction. Usually Trader Joe’s is pretty good about this sort of thing – giving you a little nudge on the packaging and suggesting that you maybe, you know, serve your Korean scallion pancakes with soy sauce and vinegar, or explaining why bamboo flowers are being served with your rice, or what have you. No such luck here. Instead, I’m left looking at this cloudy bag of olives, straining the limits of my imagination in an attempt to integrate these into my daily diet. Martinis maybe? Should I put these in martinis? Again? The lemon zest whisper yes, but all the floating herbs and slices of red pepper say no pretty clearly. Can I cook with them, then? Maybe this is a sort of add on kit for the otherwise underwhelming Greek Cheese Spiral I reviewed the other day? All ready to spread on top of those folded cheese coils? Native Greeks, the very ones who pack this product of Greece perhaps, surely have no such uncertainties – gobbling them down by the handful, stuffing them into their mouths one after another, and firing out the pits with machine gun-like efficiency, I’m sure. Actually, as it turns out this sort of marinated olive dish is actually meant to be eaten as is – as an addition to an anitpasto platter, as an appetizer in of itself, or as a stand alone cocktail snack. This being a Mediterranean snack, these marinated olives can naturally be served up with some cheese, cured meats and, of course, wine. If that sounds good to you, just make sure that you’re prepared for how very intense this flavor combination is. A briny olive can be overwhelming by itself, but combined with the bitter citrus bite of lemon zest and a pungent dose of thyme and other herbs, they become an entirely new beast. This is certainly not an appetizer to serve to the unaware or persnickety. Both types of olives in this duo – the purple kalamata and green chalkidiki – have firm, almost tough flesh, and come loaded up with that intense sodium punch you expect from a preserved olive. On top of this we have a strong lemon zest – which tastes about as bitter as it does citric. The lemon zest does a lot to balance out the strong salty taste of the olives, but it also leaves a lingering bitter aftertaste that, while not unpleasant, definitely doesn’t invite binge consumption. The titular herbs, though still strong, are understated in comparison. The ingredient label don’t provide a description of what seasonings go into the mix, but you can certainly detect thyme and rosemary and probably garlic. Not easy flavors to contend with, but certainly interesting ones. The result of all these parts is a simple dish that is very strong, but also intriguing enough to invite a second and third tastes. In some ways, it’s a cocktail snack’s cocktail snack. They look nice, they’re compelling to try, but no one is going to need more than a small handful of them. It’s telling that the serving size is given as “3 olives” on the package. That seems about right – after three olives you’re about ready to move onto something else. If you’re looking for something to pique your guest’s palettes, these marinated olives might be just what you need – the culinary equivalent of brash bit of trumpeting mid-concert. For more mundane uses, such as satisfying your afternoon munchies, you should look elsewhere. Would I Buy Them Again: I doubt it. I’m not sure I or my friends are quite cultured enough to appreciate these. Final Synopsis: A more intense olive for your appetizers.